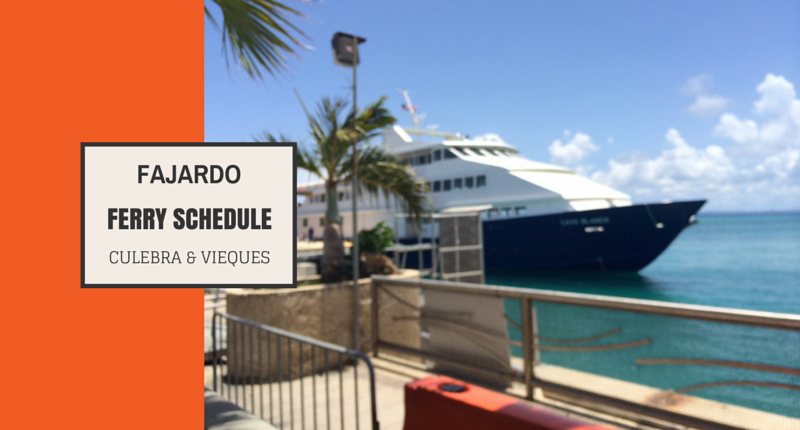 Many times the ferries are cancelled due to weather or maintenance issues and you can easily be left stranded in the town of Fajardo and not get to your desired destination. 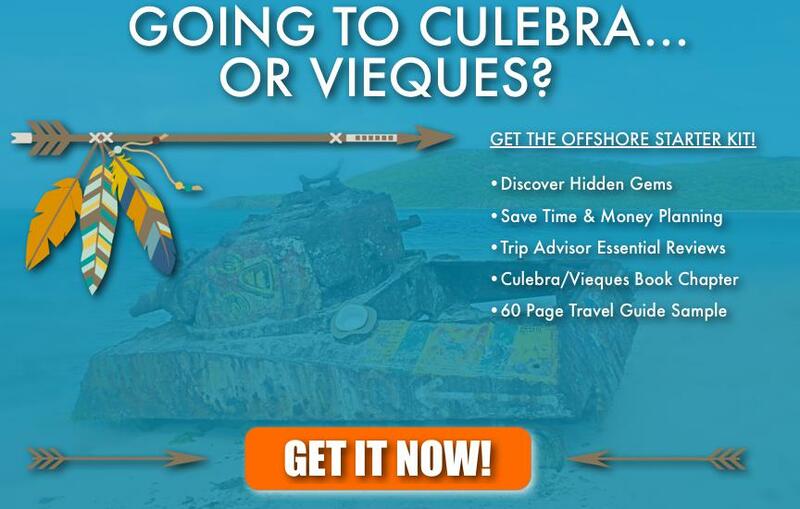 As we’ve mentioned many times in this book, you have to come into this with a heavy dose of patience and be travel flexible with your plans in case the very real possibility exists that you won’t get on that ferry to go to Culebra or Vieques. It’s happened to us more than once. This is the ugly part of the process. While we do feel that the cost of the ferry is beyond reasonable at $2.50, the process of getting a ticket to and from the islands is a bit of a headache. We’ve been in long lines only to not get tickets because they “sold out” and we had to scramble to make new plans (Playa Escondida in Fajardo). The truth of the matter is that you simply have to get in line by 4:45AM at the latest for the 9:00AM departure. The people who show up at 7:00AM are already looking at long lines and no guarantee. We found the sweet spot is between 4:30 AM- 5:00AM, and bring a book and comfortable chair because you will wait a long time. We wish there can be another way, but this pretty much ensures your best shot of catching the early ferry for a full day trip. There are a limited amount of tickets to be sold and the 9:00 and 9:30 ferries always sell out. What happens is that residents of Culebra and Vieques take priority over travelers, tourists, and even Puerto Ricans from the mainland. The huge lines are made worse by some locals standing in line to “buy tickets for others” and then re-sell them. Sometimes you’ll be in line for hours, then see a new group of people all of a sudden come and get serviced right away. These are the “locals”, and I can see why travelers and tourists would not like to see this at all. Still, we write this so that you can be aware and come in with the right frame of mind so as not to ruin your day. It makes sense to buy your round trip tickets when you have a chance, but even that sometimes you can’t do and have to do the line all over again on your way back! In terms of the long lines, you are going to be under the hot sun at points of the wait so make sure you bring umbrellas for shade, a comfortable chair, and a cooler filled with snacks and drinks. We recently came across some information that a company is now taking online booking at their website called Culebraferry.com. Use at your own risk since we haven’t yet and we really hope they do a good job trying to organize this process. Sometimes though, you may be able to call ahead and “hold” your reservation with a credit card if you happen to be extremely lucky and get through on the phone. About 50 tickets are set aside for “future dates”, and you would pick up your tickets at the far right window when you get to the ticket booth. This is not a guarantee of your ticket, but does give you slightly better odds and you can get there later and not at the early hour of 3:45AM. The phone numbers to call and give it a shot are: 787-497-7740 or 787-494-0934 x 2729/2727/2736. Call Mondays-Friday from 7:00AM-3:00PM. You can also try to write to the inbox at their facebook page (see Information to stay updated below) or email them at: reservaciones@atm.gobierno.pr. Car rental companies will not allow you to take your car to the offshore islands so you need to make arrangements for transportation once you’re in the island you chose. There are car rental companies available in both Culebra & Vieques, and we gotta say exploring these islands in a jeep is where the fun is at! You can also find local transportation like taxis at both the ports of Vieques and Culebra. See below for information where to rent your car. In terms of parking, you should have no problem finding a safe parking company nearby the docks in Fajardo that will charge you $5.00 a day. It is a public facility and is open 24 hours a day. Make sure to bring your ticket with you as you’ll need it to pay on your way out. As we mentioned, the ferry service allows you to bring your beach chairs, umbrellas, and coolers where you can store them inside the ferry. If you bring more than you can carry they will charge you more or simply won’t let you bring it. Make sure to bring your cooler filled with drinks, food, and anything else you will need. Once you get your ticket, there’s more waiting to be had as you are seated in an orderly fashion for a few hours before the ferry arrives. If you’re the type that gets sea-sick easily we strongly suggest you take medicine for that as the seas on this voyage are very choppy and the seas are rough. We’ve seen people throw up, which is not cool. But it happens so make sure you can handle being in the ferry for about the 1 hour you will be at sea. The seating inside the ferry is air condition and it does get kind of cold so bring a jacket. 1 Way Tickets: To Culebra – $2.25. To Vieques – $2.00. Kids & Seniors $1.00. It’s imperative the day of your trip to check for any last minute information on the ferry so you can know as far in advance as possible if any hiccups happen. Click on Link for Google Maps directions. I will be traveling to Puerto Rico next week and I am a bit apprehensive and really confused as to how to plan my trip. I have booked 1 night in Old San Juan and 2 nights in Fajardo with the intention of taking the fairy to Viesques for a 2 night stay and hoping to make a day trip from Viesques to Culebra. However, I am so confused and don’t know how to go about getting from Island to Island. Sounds a lot harder than it should be. Please advise. I NEED ALL the help i can get. Shawn, I have a trip plan to Puerto Rico in March, 2016. Having a hard time getting tickets for ferry from Fajardo to Vieques. Any suggestions. Hi Linda: I would strongly suggest then to try to book a flight from Isla Grande Pier in San Juan. Better to pay and be safe. is there any way to book the tickets to Vieques online? My taxi driver was telling me today that there is a website where you can at least check the availabilities.